A couple months back, I celebrated the two year anniversary of the abdominal surgery that helped me to feel comfortable in my body again. Not long after that surgery, I bought and wore the first bikini that I’d had since 1999 (before I got pregnant for the first time), pictured at that link. Over the last two years, I’ve had tons of problems with my health, including massive weight gain thanks to many different factors. My confidence has been hit with many hard blows, both physically and psychologically. I’m trying very hard, though, not to let shame and fear rule my life, and with that in mind, I decided to rebel again society’s norms. I bought a bikini. Yes, I weigh over 200 lbs. Yes, I’m an obese woman. Yes, I have fat rolls and stretch marks. And YES, I am going to wear this bikini this summer. This is my body, and I’ll do with it as I wish. It may be terrifying, but about five years ago, it was terrifying to wear shorts in public, and now, I don’t have a problem with that at all. By the end of the summer, I want to be in a place where I don’t even stop to consider what it means to be obese and in a bikini. It will be my new norm. 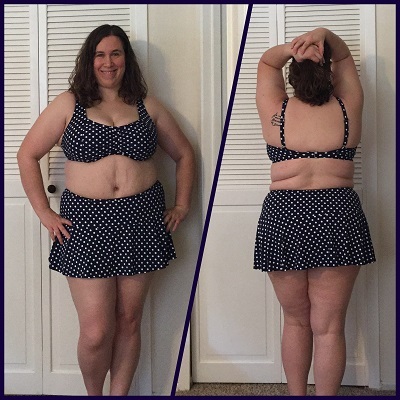 This entry was posted in Wellness and tagged body image. Bookmark the permalink. Go you! I love it! I’m one of those people who generally won’t even wear shorts, so I love how you are deciding to be strong and confident! So empowering. You go!! I never wear shorts, so you are way ahead of me on that bravery! Good for you! You look great rocking your bikini! Love this and love you!!! I won’t wear shorts or swimsuits, so I definitely need some of your bravery! !